For years our focus has been on the youth training. In our Bambini group children between 5 and about 8 years are learning to play table tennis step by step. We work with them in a playful way and with lots of fun. Older starters between 9 and 12 years will be trained in our beginners’ group. These groups are trained by at least two coaches. 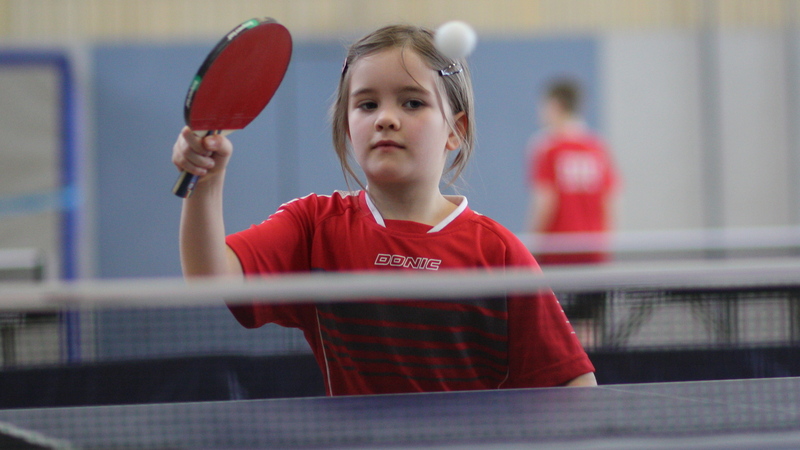 Especially at a young age the kids can make huge progress in their table tennis skills which motivates them even more to learn new aspects of the sport. To foster their motivation and enthusiasm, our coaches teach the basic skills in a very playful manner. Once the kids have learned the basics, show enthusiasm at practice and interest in competitions, they can join one of the youth teams and also take part in the youth training. The beginners’ training takes place in two different age groups, which are described below. In the Bambini group girls and boys who are between 5 and about 8 years old are learning how to play table tennis step by step every Saturday (except during school holidays). Practice lasts 90 minutes and offers a lot of variety for the kids. The first part consists of coordinative warm-up games. The kids learn new kinds of movements which will help them learn the basic table tennis techniques and also give them a good sportive education. In addition, we do specific table tennis exercises away from the table, footwork exercises and games that train their feeling for the ball. Before the kids start with easy exercises, the coaches always explain and demonstrate them in detail. Practice ends with a game where the kids can burn off any remaining energy. Finally everyone comes together for a wrap-up of the training session. Most important to us is that our bambini learn the general and table tennis specific basics in a playful way. Also older starters up to the age of 12 are welcome in our table tennis club. For them we offer our beginners’ group, where the children are learning table tennis in an enjoyable atmosphere and with a varied training. The beginners’ group training is similar to the three parts of the Bambini Group, since we also do not require prior table tennis skills for this group. As older children normally have a better coordination, the training is adjusted correspondingly. There have also been many children from the beginners’ group who moved on to join the youth training and teams later on. If you are interested or need further information on the Bambini or beginners’ groups, please don’t hesitate to contact Christian. Our team of coaches is looking forward to welcoming you!